With major house builders reporting positive sales results and the government announcing that it is to commission the building of thousands of new affordable homes on publicly owned land - which small house builders will get the chance to build - 2016 has started on a positive note for all areas of new build industry. It comes after a year when all regions, to a greater or lesser extent, saw prices rises and, as Shaun Peart, Managing Director of LSL Land & New Homes explains, sets the scene for an interesting year ahead. “House building certainly became one of the hot topics on the UK’s political agenda in 2015 and, as a result, there has been renewed confidence and activity which, in turn, has impacted on prices - as the LSL New Build Index demonstrates. 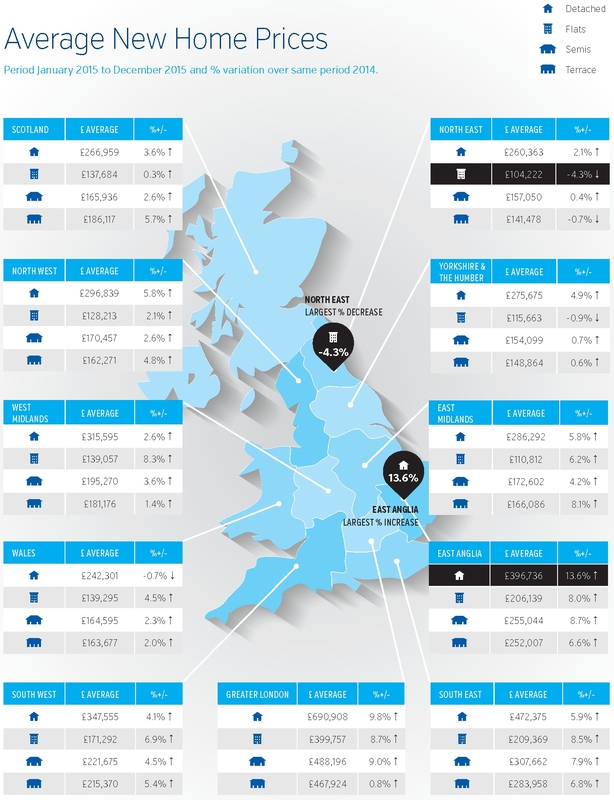 In December 2015, for example, the year on year overall price index remains relatively static at 6.1%, which is slightly down on last Decembers figure of 6.9%, but could be explained by slowing prices in Greater London which recently ceased to be the region with the highest year on year price growth. As the chart illustrates, it seems that East Anglia has now moved into pole position with average prices rises of 9.1% over the year to November 2015 - compared to the same period in 2014 - and the South East and East Midlands also showing significant signs of improvement.